“Nightmares” Copyright © 2008 by John Ecko. All rights reserved. “The View From Here To There” Copyright © 2008 by John Ecko. All rights reserved. “Gunslinger” Copyright © 2008 by John Ecko. All rights reserved. My name is John Ecko and I create visual poetry, also referred to as concrete poetry. I am still feeling my way around this site so thank you in advance for your patience. In the meantime, above is an example of what I do. Please feel free to comment on any of my works and let me know what you think. If anyone else out there dabbles in concrete poetry and would like to post and promote their works here, please contact me on this thread to work out the details. 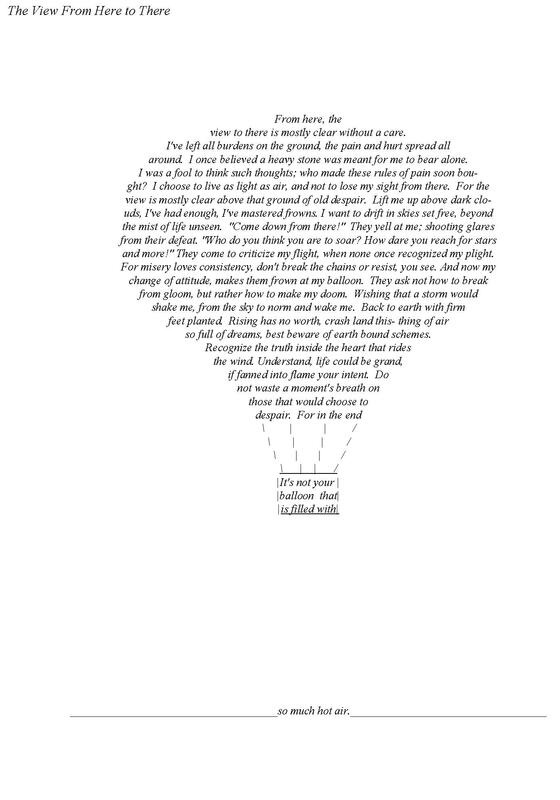 This place is open for all discussion, sharing and promoting on visual poetry and I would love to hear from you. I have been writing poetry of one form or another since early 1990. My early work was an undisciplined form of free verse that I used to keep my mind and heart on the same page. Later, I began to study all traditional methods of poetry from the sonnet to the villanelle. I grew quite fond of many french forms of poetry. Robert Frost is one of my earliest influences. He showed me through poetry that once you learn the art and get a good grasp of things such as iambic pentameter, rhyme and rhythm, you can expand upon them. Not so much as breaking the rules, but bending them with the ultimate goal of reaching a place where the rules no longer apply. I discovered concrete or visual poetry on accident. 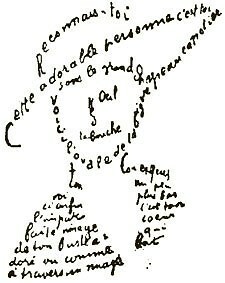 I came across the famous calligramer, Guillaume Apollinaire, and became fascinated by his use of word and visual messages and began to try if for myself. I began using my mind as a photographer of emotions, and simply captured images and combined them with words until I too discovered the knack for concrete poetry, or in my case, shape poetry. This collection of visual poetry I’ve created is the result of a lot of hard work and fusion of all that I’ve learned and seen in my mind’s eye, and this experience has taken me on a journey of self discovery this last year. What I like most about this form of poetry is that it pushes the edges of poetry and forces it to expand and destory the boxes of thought that some would try to contain it in. I believe all good poetry should strive to do this while maintaining the heart and mind of the individual through expression. Please sign in here, leave a message or tell me a little about yourself .